I really recommend Orange Apartment in Hvar city. I spent 5 nights in it. I am enthusiastic about it. it is located just a ten minute walk from the harbour, in a very quiet and safe area. 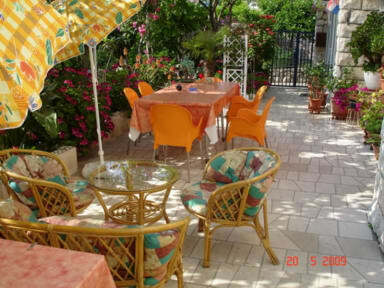 The facilities are very clean, practical and functional and the courtyard in front of the house is very nice. Our host Ive is helpful, friendly and very welcoming to us. I did appreciate my sojourn in his house. Since we arrived, the host explained us what we can do in the city of Hvar and how to go from the flat to the different places. The house is well located, you can do what what you want by walk. It is a calm and cosy place with à nice outside. Moreover, the host permit us to let our bagages all the afternoon in the house after the check-out. I recommand! Overall it was amazing!! The bedroom was wonderful and the host was very welcoming! He showed us the best places to go and was available at any time when we had questions. I would definitely recommend this place. L'auberge est située sur les hauteurs de Hvar à 5-10mn à pieds du port. Et comme son nom l'indique tout y est orange ! Le proprio est cool, il accueille avec un jus d'orange et donne pleins d'infos et des bonnes adresses. La terrasse est super sympa on peut en profiter notamment pour le coucher de soleil avec une jolie sur la mer au loin. La chambre est prope avec une salle de bain privative. Il y a une cuisine équipée à l'usage des hôtes.